Disclosure: My children and I received complimentary tickets to visit the Adventure Aquarium. All opinions, as always, are my own. Meet Mike. Mighty Mike. The biggest baddest alligator west or east of the Mississippi. And he’s only at Adventure Aquarium in Camden through Labor Day weekend. Which is why I leaped at the free opportunity to take my 5 kids to Adventure Aquarium to see Mighty Mike only 2 weeks after a school trip there for my middle sons. A few facts about Mike to wet your appetite. ‘Cause he doesn’t need any help with his. Mighty Mike weighs about 800 pounds and measures almost 14 feet in length making him the largest alligator on display outside of Florida. Mighty Mike only consumes 300 pounds of food each year. We humans eat more than 6 times that amount. American alligators were close to extinction only 40 years ago. An alligator has the strongest bite of any living animal. Yet, an adult man can hold their jaws closed because the muscles for opening the jaw are relatively weak. 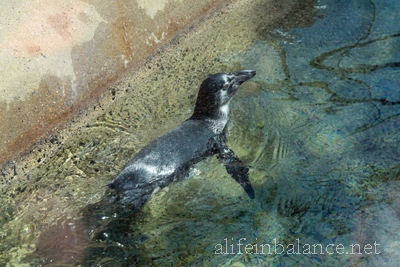 After meeting Mighty Mike, my family’s next stop was the Penguin exhibit to see the 5 month old baby penguin, Casanova. Born in January 2013, you’ll see more of Casanova this summer as he makes his official debut. Then we were off to the Sting Ray Beach Club to gently pet the sting rays. As you can see, some of us thought it was a great idea, and others weren’t so sure. 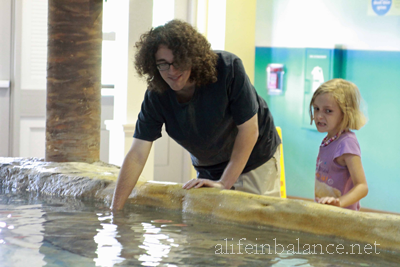 My teenager headed back to pet the Sting Rays several times during our visit. I loved seeing the sting rays flap their “wings” at us while they glided along the edge of the tank. We missed feeding the sting rays by a few minutes though we had fun watching the adults and kids in the club feed them. Nearby is the Touch a Shark exhibit where you can touch Pacific Brown-banded and White-Spotted Bamboo Sharks. 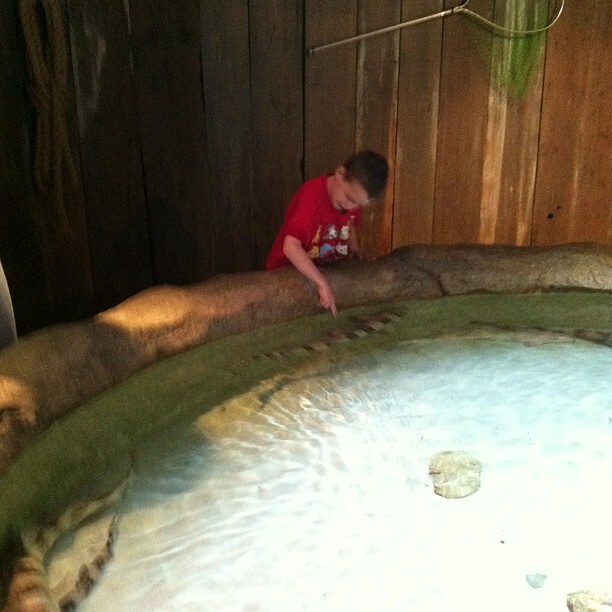 Don’t forget to head upstairs for more opportunities to touch sea animals. My 7 year old son was fascinated by the sea urchins and star fish. Despite their spiky appearance, the star fish are actually soft and squishy to the touch. Ah, all 5 kids in the picture. Let’s forget that some aren’t looking at the camera. Hours: open 365 days a year, from 10:00 AM – 5:00 PM. Special Hours during the summer! Daily Activities at the Aquarium – Who is fed when, and how to get your questions answered about the sharks, penguins, fish, sea turtles, and more. My family and I have not been to the aquarium yet this year and your post makes me want to go! 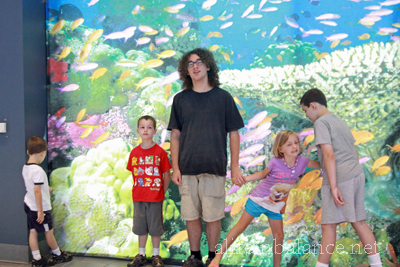 We love Adventure Aquarium! Mighty Mike is cool, we have to stop by and meet him. 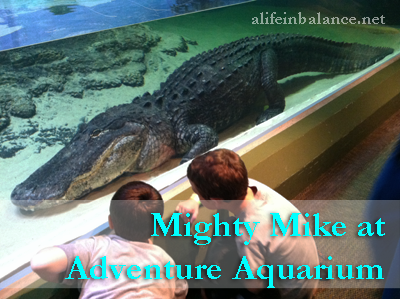 We loved seeing Mighty Mike! What a fun day! 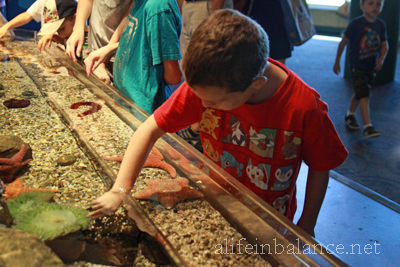 We absolutely love Adventure Aquarium! It’s a must-see every summer for us. We got an email announcing Mike’s arrival and I immediately planned a day trip to see him next month. Looks like you all had a wonderful time! I so hope we get to see Mighty Mike!! !